Here is What Have We Learned from Week 16 of the 2017 NFL Season, thanks to the AP Pro 32 for photos & help in this article. 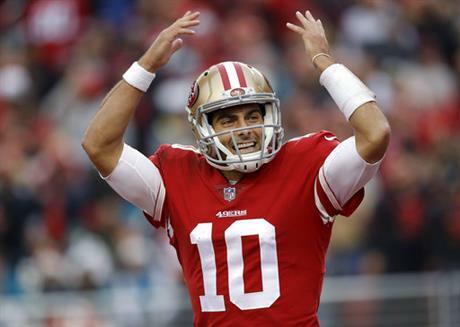 Garoppolo leads 49ers to historic in-season turnaround-Jimmy Garoppolo has already helped the San Francisco 49ers make a bit of history for the NFL’s best in-season turnaround. No team that ever started a season as poorly as the 49ers did with nine straight losses has ended it as well as it is going in San Francisco with Garoppolo having led the team to four straight wins. The 49ers (5-10) already have the best record of any team that started a 16-game season with a 0-9 record and they can double the previous best win total held by many teams by winning the season finale Sunday at the division champion Los Angeles Rams (11-4). The midseason arrival of Garoppolo in a trade from New England has been just the spark the 49ers needed. He has won all four of his starts for San Francisco and his 1,250 yards passing are the most by any player in his first four starts for a franchise. That play has lifted the entire team and the expectations surrounding the 49ers. Running back Carlos Hyde even talked about a possible Super Bowl run in 2018 now that Jimmy G is in place. “I definitely would want to rein that in,” Shanahan said. “I haven’t spoken to Carlos yet. Just from what I know of Carlos, I have a pretty good feeling that he was halfway joking. Ending the season on a streak such as this and falling short of the playoffs is rare. The 49ers could become the 41st team in the past 23 seasons to win their final five games but only the 2005 Miami Dolphins missed the postseason in that group. Whether there’s a big carry-over effect remains to be seen. Nearly half of those teams — 19 of 40 — missed the playoffs the following year whether it was because of quarterback injuries that doomed teams such as Green Bay this season, New England in 2008 or Washington in 2013, or natural regression that impacted other teams, finishing strong is no guarantee of future success. “It depends on the people you have and how they show up ready to go,” Shanahan said. “If you end the season on a real positive note and you’ve got a group of guys that like reading their own press clippings and feeling good about themselves so they can relax, then that type of stuff will hurt you. The mood is far different than it was when the season started. The 49ers struggled mightily early in the season, including a record five straight losses by three points or fewer. But sticking together through that process has paid dividends now, according to Shanahan. “It was hard when we went through it, but the fact that we were able to get through it and still find a way to get some wins here recently, I think it made our team stronger,” he said. Surging Ravens look for 1 more win to end playoff drought-Playing their best football at just the right time, the Baltimore Ravens need only to beat Cincinnati at home on Sunday to reach the playoffs for the first time in three years. Despite their recent surge, the Ravens have been performing before thousands of empty seats at each home game. Seahawks show resolve in keeping their playoff hopes alive-All the built-in excuses were there for the Seattle Seahawks if they fell short. Those factors still may end up being the story of Seattle’s season if it’s unable to find a way into the playoffs for a sixth straight year. But the chances at the postseason were extended into Week 17 by winning at Dallas on Sunday. And while it wasn’t pretty, the 21-12 win over the Cowboys may be one of the more gratifying wins of Pete Carroll’s tenure after the Seahawks lost two straight, including a 35-point whipping by the Rams a week earlier. If there was a question about Seattle’s resolve, it seemed to be answered in Dallas. Even if Seattle doesn’t end up getting the help it needs, the win in Dallas at least made Week 17 relevant and continued a streak during Carroll’s tenure of every home game since 2010 having some significance. Wagner wasn’t back to full health but was moving better against the Cowboys and teaming with Wright allowed Seattle to be solid against Ezekiel Elliott and Dallas’ run game. With Seattle missing so many key pieces on defense, the importance of Wright and Wagner hasn’t been lost on Carroll. “Now more than ever because of the other guys that aren’t around, those guys are more significant because their presence and their leadership and their consistency is just something we can bank on even more and they’re better now than they’ve ever been,” Carroll said on Tuesday. Carroll said he spoke with safety Earl Thomas about his decision to visit the Cowboys locker room after the victory and his comment made to Dallas coach Jason Garrett, “If they kick me to the curb, come get me.” Carroll said Thomas was concerned with the impression it left with Seattle’s fans. NFL won’t have Sunday night game on New Year’s Eve-The NFL has announced there will be no Sunday night game on New Year’s Eve to ensure matchups with playoff implications that impact each other are played at the same time on the final week of the season. Derek Carr struggles in Oakland’s latest loss-Derek Carr got paid a lot of money to make plays he couldn’t against the Philadelphia Eagles on a national stage. Hurried and harassed for much of Monday night, Carr made poor decisions, ill-advised throws and struggled in tough, windy conditions. With the game on the line, his second interception led to a go-ahead field goal in Oakland’s 19-10 loss. It wasn’t all his fault, of course. A banged-up offensive line missing Pro Bowl left tackle Donald Penn didn’t give him much time, wide receiver Michael Crabtree was invisible and both running backs lost fumbles. Carr was 15 of 29 for 140 yards with one touchdown and two picks. Philadelphia’s Nick Foles was 19 of 38 for 163 yards, one TD and one interception. “I will always continue to look at myself first and try and fix what I can fix and try and help those I can along the way,” Carr said. For Carr, it has been a disappointing season. The Raiders began the year with Super Bowl aspirations after going 12-4 in 2016. But they’ve been inconsistent all season and Carr has regressed following a breakout year. “You have to work hard when it gets tough,” Carr said. “When things get tough, a lot of people point fingers. I’ve tried my best every single time to stand up here, be a man and just take it. That’s who I am, that’s how I was raised and I’ll always be that way. Carr led the Raiders to seven comeback wins last season and threw for 3,937 yards and 28 touchdowns with only six interceptions before breaking a leg in the next-to-last game of the year. He was rewarded with a $125 million, five-year contract in the offseason that briefly made him the NFL’s highest-paid player. But his performance hasn’t matched his pay check. Carr has 21 TD passes and 12 picks, matching his totals from his rookie season in 2014. “We can look at the good times we had a year ago and the hard times we had this year and lay out the plan and ask what was different,” Carr said. Another touchdown reversal has NFL facing more scrutiny-With yet another touchdown reversal by officiating chief Al Riveron, the only thing that’s “clear and obvious” anymore is the owners’ decision to grant full replay authority to NFL headquarters has only added to the league’s cluster of headaches. —The Packers drew the ire of several teams for placing quarterback Aaron Rodgers back on injured reserve with a playoff berth out of reach. He returned from a broken collarbone to play in Week 15. It didn’t appear he had a new injury before going back on IR. —The Denver Broncos activated rookie receiver/returner Isaiah McKenzie for the first time since his sixth fumble led to a safety and his second benching. He cost them a chance at points just before halftime at Washington when he caught a pass from Brock Osweiler but instead of stepping out of bounds spun back to the middle of the field and was tackled at the 20-yard line as the clock ran out. Lions’ Caldwell focused on Packers, not his future with team- Beginning what could be his last week as head coach of the Detroit Lions, Jim Caldwell was his usual deflective self. He shrugged off questions about his future, but at the same time, admitted that his team too often wasn’t good enough to get the job done. The Lions (8-7) lost 26-17 Sunday at the Cincinnati Bengals, eliminating them from playoff contention, and raising questions about Caldwell’s future with the team. As he began preparations for Sunday’s season finale against the Green Bay Packers, Caldwell insisted Monday that he’d had no talks about his future with GM Bob Quinn since the loss to the Bengals. He at least seemed to recognize the reasoning for the questions. Caldwell agreed to a multiyear contract extension in the fall that was guaranteed through 2018, so if the Lions opt to fire him, they would only be required to pay him for next season. Hired in 2014, Caldwell’s first Lions team went 11-5, earning a wild-card berth but losing in the playoffs to the New Orleans Saints. His teams have been mediocre at best ever since. In 2015, they were 7-9, and last season, went 9-7 to earn another wild-card berth, but lost the last three games of the season to squander the NFC North title and then were beaten by the Seattle Seahawks in a wild-card playoff game. A loss to the Packers on Sunday and the Lions would be at .500 (24-24) the past three seasons under Caldwell. Caldwell wasn’t about to dispute the reality of the team’s record while he’s been head coach. “If you want to get an indication of where you are, the great thing about the National Football League is all you have to do is look at your record,” Caldwell said. “We’re just a little bit above average, and a little bit above average is not good enough. There are no bowl games in this league. Caldwell’s players are standing behind their coach, willing to shoulder the blame for their failures. At the same time, they know that a coach is measured by wins and losses, and lately, the Lions haven’t been measuring up in the standings. “We understand that’s the nature of this business,” Stafford said. “We also understand what he does behind closed doors. As much as he won’t be able to avoid it, Caldwell would prefer the focus this week not be on his future. “I’m not concerned about how I feel,” Caldwell said. “It doesn’t matter. The fact is we’ve got a game left to play. It’s an opportunity for our guys to get better.